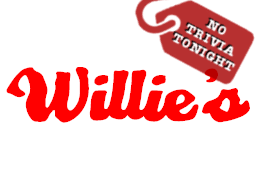 There will be no trivia tonight (4.11) at Willie's, due to the Caps starting their run for back-to-back Stanley Cup victories! The Caps have game 4 (away) next week - it's TBD if Willie's will be cancelled again, so stay tuned and check back here. Go Caps!